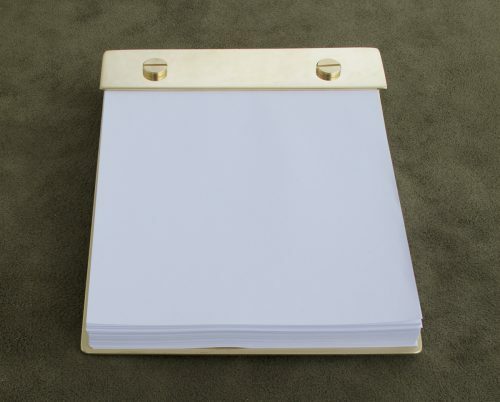 We developed the Brass Desk Pad after years of using scrap paper to make lists and notes. We quarter 8.5 x 11 paper with a paper cutter, then use a standard 2-hole paper punch for the holes. They fit perfectly in the pad. You can also order refills by the inch but the idea is to re-use scrap paper fully, before recycling the paper. The pad measures 4.5 x 5.625 inches and made from 16-gauge brass sheet. It holds about .25 inches of paper at a time. Just rip off the top sheet to reveal the next page to use. When you get down to the bottom, unscrew and add new sheets. Note: Our pieces are custom-made upon ordering. Please allow six to eight weeks for delivery. 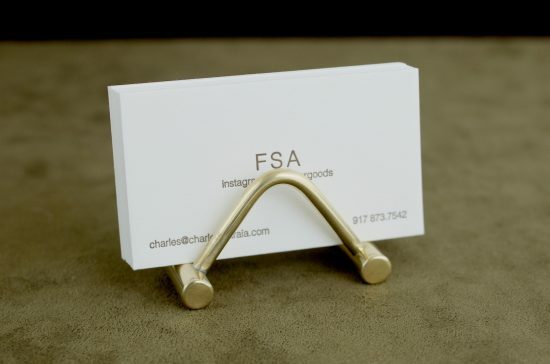 Our Card Stand is a smaller version of the Letter Stand and will handsomely hold your business cards, post cards or a favorite pen....at your desk. Hand forged from 1/8-inch solid brass rod soldered into 3/8-inch solid brass rod. 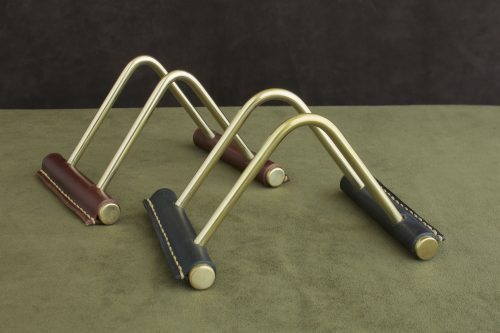 Our desk tray is hand-forged from brass and covered in soft leather with beautiful hand stitching. 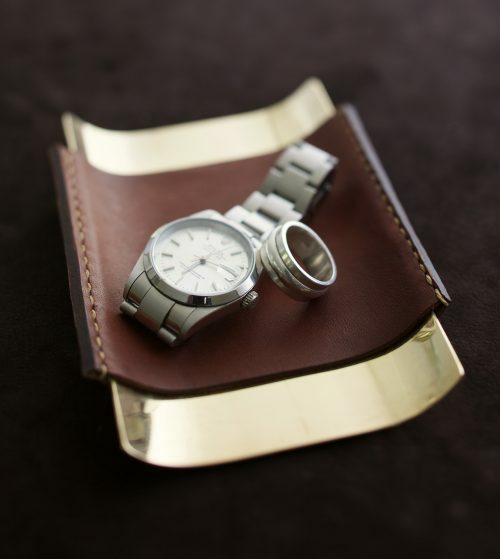 Organize your desk, bed side table or hallway table….holds pens, watches, coins, paper clips..anything that needs organizing…..our most ‘handsome’ accessory. Note: Our pieces are custom-made upon ordering. Please allow six to eight weeks for delivery. 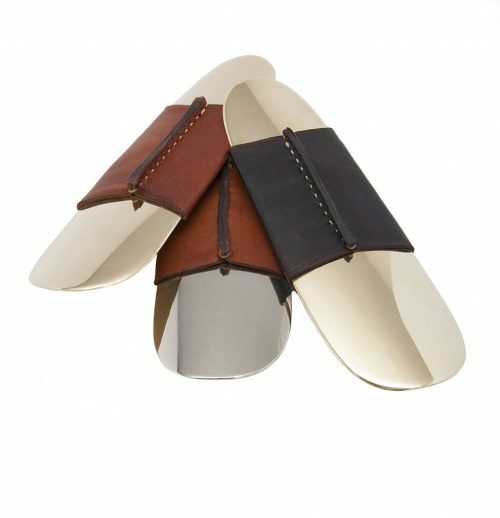 These desk trays are fully wrapped in black or brown leather. 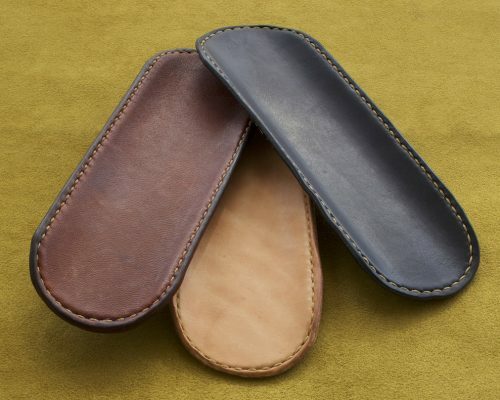 Our desk trays and catch alls are hand-forged from brass and covered in soft leather with beautiful hand stitching. 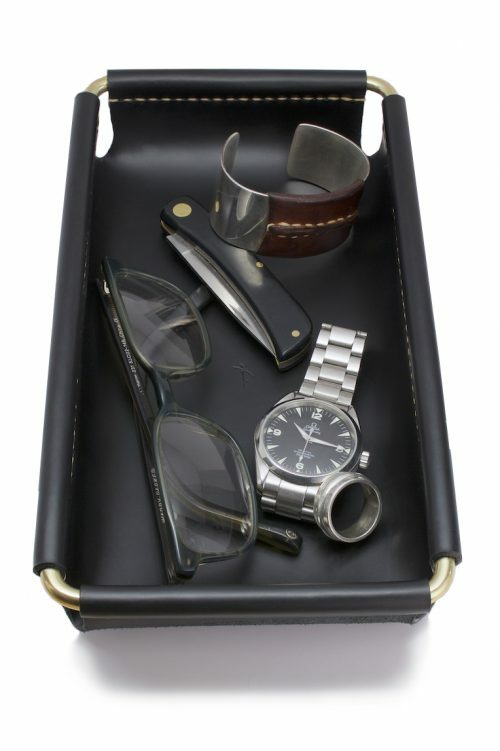 Organize your desk, bed side table or hallway table….holds pens, watches, coins, paper clips...anything that needs organizing…..our most ‘handsome’ accessory. After developing the Brass Note Pad for our desk, we thought it would make sense to make a version we could carry with us to take notes, make sketches, and work out ideas for new designs....all with using recycled scrap paper. The Leather Notebook is a must have for artists and note takers on the go. It will last for years and age beautifully. 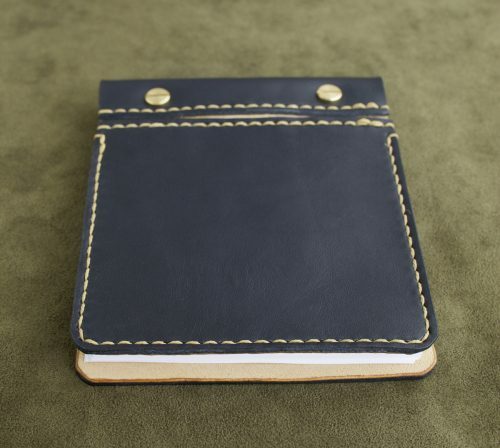 The Leather Notebook measures 4.625 x 6 inches and holds about .25 inches of paper. Available in natural veg, or black veg tanned leather. Refills can be ordered by the inch, but we want you to re-use as much scrap paper as possible. Note: Our pieces are custom-made upon ordering. Please allow six to eight weeks for delivery. 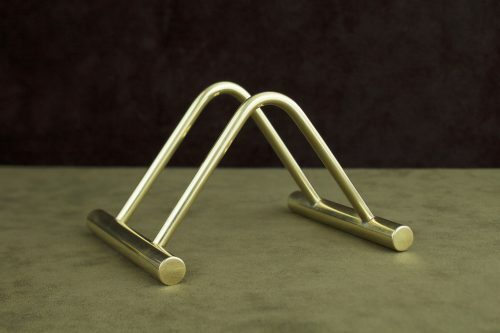 Our letter holder is hand forged from solid brass rod. It’s the perfect desk accessory to hold correspondence or bills to be paid...even favorite postcards can be displayed on them. Note: Our pieces are custom-made upon ordering. Please allow six to eight weeks for delivery. Our letter holder with leather base is hand forged from solid brass rod with hand-stitched veg tanned leather base in black, brown or tan. It’s the perfect desk accessory to hold correspondence or bills to be paid...even favorite postcards can be displayed on them. Note: Our pieces are custom-made upon ordering. Please allow six to eight weeks for delivery. 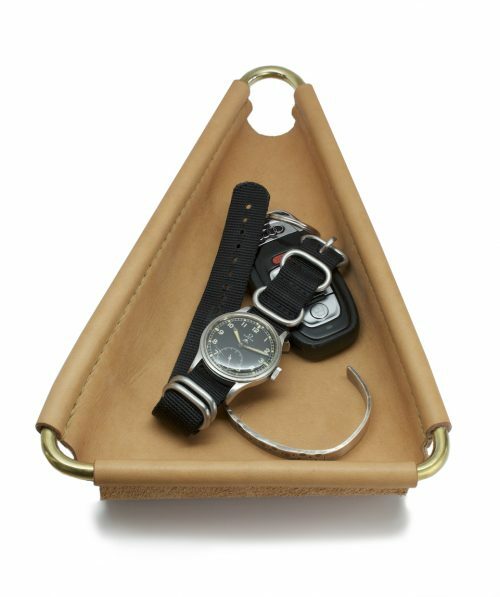 The newest addition to our desk accessory line is the Valet Tray. Slightly larger than our desk trays and capable of organizing and holding much larger objects. Generously proportioned to hold your everyday carry objects neatly and stylishly, in the entryway, on the kitchen table, or on the dresser. The frame is hand-formed, made from .25” polished brass rod, and fitted with your choice of cowhide leather in black, brown, or tan. 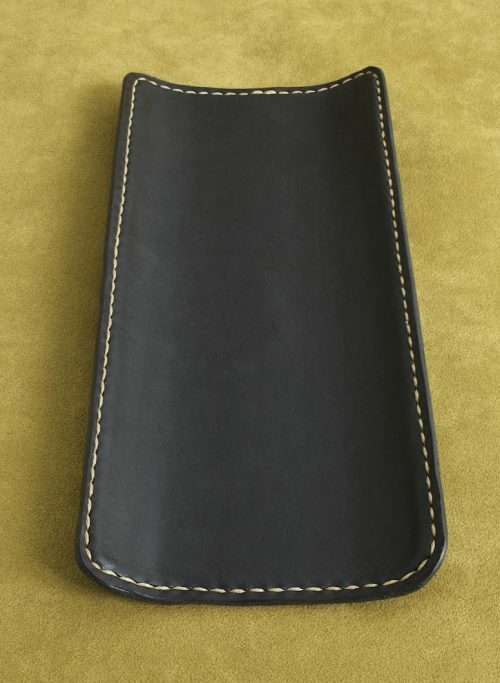 The leather is carefully hand stitched as are all our leather products, continuing the quality of workmanship that is expected from FSA Leather Goods. Our edges are burnished with beeswax and never painted. We feel it's a more organic and classic look. As a special feature, if you tip the tray towards a corner, all the change you may have placed in the tray gets funneled into your palm or pocket. Saving you from picking up each coin one at a time. We are happy to make custom sizes to accommodate a range of items that you need to keep organized and ready to go. 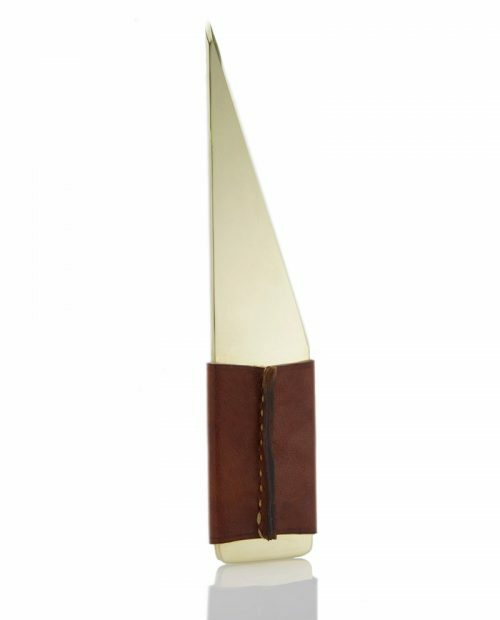 Hand-forged from brass or German Silver with a nicely designed leather section. For both men and women. Another item you didn’t realized you’d love to use.